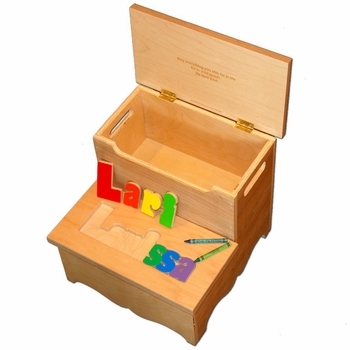 Our step up with storage offers the fun of a puzzle and the practicality of a step stool. The puzzle facilitates dexterity, problem solving skills, and name spelling. The step up feature makes it possible to reach places like the sink for essential tasks, including washing hands and brushing teeth. The hinged lid creates a handy storage space. Proudly made in the USA of 3/4 inch hardwood and built to last. The top stands 12 3/4 inches tall and it is 13 3/4 inches wide by 13 1/2 inches long. The puzzle comes with your choice of primary or pastel color letters. Finishes are all water based and non-toxic. To make this gift an even more special keepsake, you have the option to engrave a personal message or baby’s birth information underneath the hinged lid. Name can be 8 letters or 7 letters with two names. Makes a terrific newborn gift or birthday present!